Erases all data from memory, removes pictures and set most parameters to default values. They are arranged into nine regions, each with a specific focus. A Left click on any button activates the command. A Right click on the Toolbar will open the following pane where Icons for display may be selected to give a fully personalised set to meet your operational requirements. Place the mouse cursor on the icons to see their descriptions. Opens a dialog box in order to load a previously saved project file. This project file contains units, nets, and system data. It also contains the map and pictures filename and path. The map file and pictures files are loaded automatically if they are found. Opens a dialog box in order to save all project files on disk. Opens a dialog box in order to save map data into a file. The file, is named with the map name followed by a .MAP extension, and contains elevation data. Contrary to older version, the map picture will not be saved, because program allows multiple pictures per map. Each picture must be saved with the Save picture as command. New Network Save Network as.. Opens a dialog box in order to load a previously saved map file. The map file contains elevation data, and is normally associated with a picture file. Opens the Map properties form with the centre and size settings adjusted to the next map created. Opens a dialog box in order to save the networks data to a project file on disk. Open Map Save Map as.. Opens the Map properties form with the centre and size settings adjusted to the previous map created. Opens a dialog box in order to save a picture file in BMP, TIF, PNG or JPEG format. Copies the active picture to the Clipboard. Inserts the contents of the Clipboard in the active picture. Creates a new picture window where is inserted the contents of the Clipboard. Enable the selection of a source to be merged with the active picture, by copying, adding, multiplying, or logical and operation. The source can be another picture or a picture from the internet: LANDSAT (NASA), TerraserverUSA (USA only), Tiger (USA only), Toporama (Canada only), MapPoint or Mapquest. It can also be ADRG (compressed or not), or Land cover. Opens a window in order to draw Lat-Lon or UTM grid over a 2D picture. Opens a window in order to draw range rings over a 2D picture. Select Lines, Filled areas, Labels, Cities or All to add graphic objects to the active picture. Opens a window with rotation angle and stretch factor inputs that will be used to create a new picture on activation of the Apply command. Floods all map pixels surrounding the cursor position that share the same elevation. Opens a window used to colour a stratum of elevation. Opens a window used to draw a custom defined elevation contour interval. Modify a picture to force a gray scale (useful for coverage background). Modify a picture to draw shadows behind mountains. Add a distance scale to a picture. Print the four corners lat-long coordinates over a picture. Opens the Map properties window in order to extract elevation data in order to fit best all units in memory. Opens a small window that shows 5x5 elevation data records centred at cursor position along with cursor coordinates. Opens a new picture window with worldwide coverage. Places cursor at the position on a picture or a selection where elevation is maximum according to elevation data in memory. Places cursor at the position on a picture or a selection where elevation is minimum according to elevation data in memory. Initiates drawing of the performance for all links of all visible networks. Draws the Unit labels for all visible networks. Hides network performance and unit labels on all pictures. Opens the last flight animation generated with the Radio link form. Maximize the active window to the maximum screen size. If the picture is larger than the screen, use keyboard arrows or mouse to move the picture. The surface is covered according to polar coordinates around the centre unit. Range and azimuth span, and azimuth increment can be adjusted. The surface is covered according to small squares of variable pixel size. Many sites can be used to produce a combined coverage with the best signal available at each position on the map. The surface is covered according to small squares of variable pixel size. The coverage of a single transmitter side can be shown in two colours: the first colour shows the normal coverage according to a minimum signal to meet, while the second colour indicates that a signal from a second transmitter is interfering. Interference occurs when the minimum Signal to Interference ratio is not met. The surface is covered according to polar coordinates around the centre unit. Range, azimuth span, and Fresnel Zone minimum and maximum clearances can be adjusted. The surface is covered according to small squares of variable pixel size. Many sites or waypoints can be used to produce a plot of areas where the percentage of Units being covered by a defined Central Unit are displayed at each position on the map. A Linear plot of the radio path performance between a mobile unit following a Route, defined by waypoints, to a fixed Central Unit is performed in defined 'step' sizes. 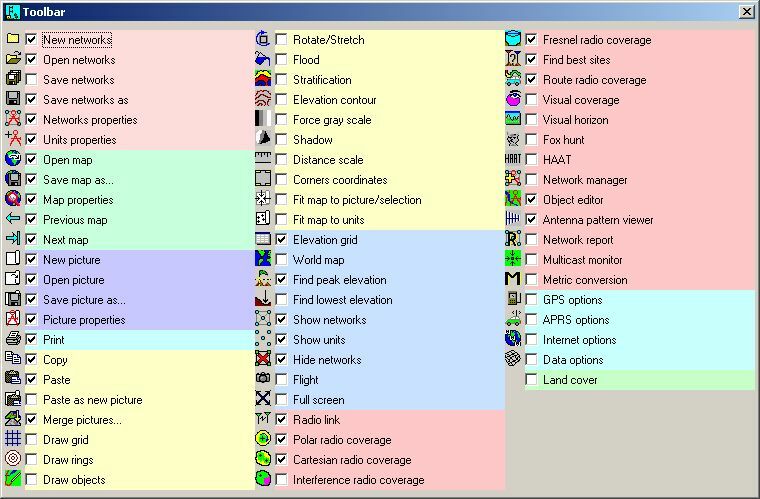 Any radio path can be examined in detail using the Radio Link pane. Opens a form in order to initiate visual horizon drawing. Opens a form in order for the program to draw bearings from up to 6 unit locations. Opens a form in order for the program to calculate the Height Above Average Terrain. Opens a form in order to visualize the relationship between network components or change network size. Opens a form in order to edit object files. Opens a form in order to view antenna patterns. Opens a form in order to show or print the performance matrix of all network links. Opens a form displaying the last messages received on the multicast channel defined in GPS options. Opens a form to perform metric conversion between two text boxes. Opens a form in order to initiate reception from the Automatic Position Reporting System. Opens a form in order to set preferences for SRTM , Toporama, Terraserver, and Lansat download from Internet. Opens a form in order to set preferences for the elevation data extraction method that will be used in Radio Link and Network performance. Land cover options are also available on this form. When Land cover is selected in 'Options/Elevation data/Land cover' and the Land cover data file is present on your computer, enabling 'Land cover' on the 'Toolbar Options' pane will show the Green background button below beyond Region 8 of the toolbar. The Green background shows the the data is available, and is being used in propagation calculations. A click on the button changes the background colour to Red, disabling the use of the data in the calculations. Where the data file is not available on the computer only the Red background will be displayed. A Green button shows data is available and in use. A Red button shows that the data is unavailable for use.